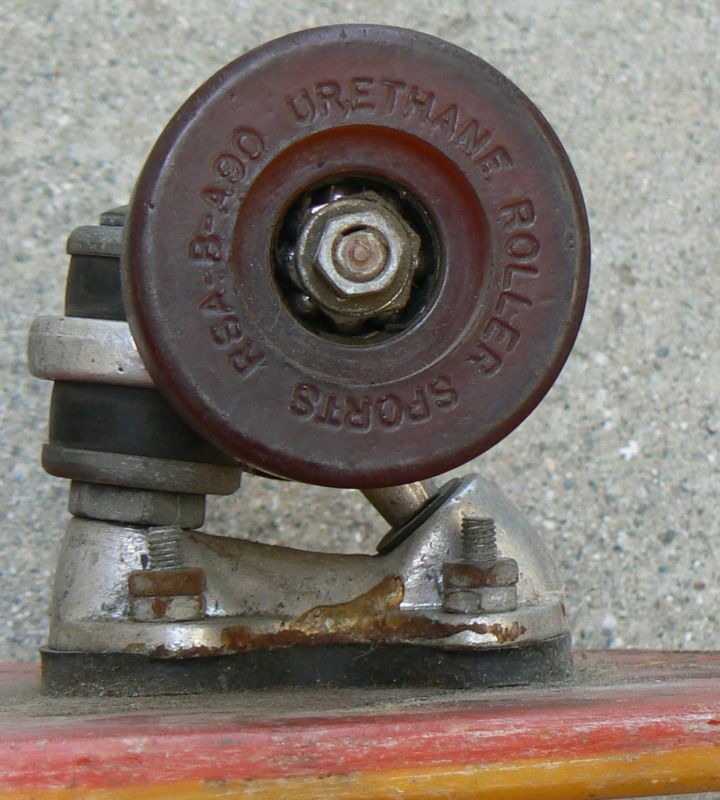 The Urethane wheel revolution happened in the early 1970's and I got my first skateboard around 1974. 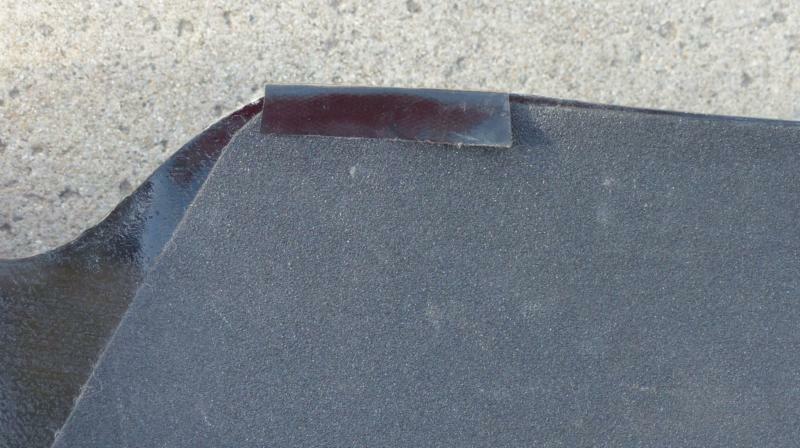 It is a small, thick fiberglass skateboard. It is 27 inches long and 6.5 inches wide. Back then, there were two trucks, Chicago and Metaflex. Naturally they had different bolt patterns. Chicago had 3 holes, and Metaflex had 4 holes. I had the Metaflex trucks. The bearings were loose ball bearings. The wheels were 55mm in diameter, the rear wheels were 'Stokers' which were 50mm wide, which were wider than the front wheels which were 30mm wide. No idea why. This was made out of 1/4 inch thick plywood with some fiberglass on the top and bottom. This skateboard was quite light. It also had some flex which was great. Unfortunately, it was not very strong, and when I jumped on it, it broke. I did learn that I liked flexible skateboards and that it was difficult to make a light skateboard that was strong enough. I made this in wood shop in 1976. It is 30 inches long and 7 inches wide. It was bigger than my other skateboards and it had a shape very similar to a surfboard, though I can't think of a reason why. The boards of the time were generally shaped like surfboards. It was made of strips of oak and walnut glued together. It sure looked pretty. It was roughly an inch thick, thick enough not to break, though it had no flex. I use a clear urethane coating on the top and added sand in strips for grip. I used 'Wheels of Fire' to get around in college. It was too small and unstable for my uses. During Christmas break in 1979, I built my first real fiberglass skateboard. My friend K. Schwartz did most of the fiberglass work. I decided I wanted a really big skateboard. It was 36.75 inches long and 10 inches wide, which isn't huge by todays standard, but was monstrous in 1979. I didn't know much about fiberglassing and used polyester resin because it was cheaper than epoxy. I used woven fiberglass cloth. I used lightweight fiberglass cloth for the top layer. I used fiberglass rope, which I unwound. I used fiberglass mat. It was pretty thick and quite heavy. It was also quite strong. It was shaped more or less like a surfboard. I got the biggest wheels that were sold at the time, Krytponite 70mm, and the widest trucks that were available, the ACS Lite II, which had 8 inches wide axles. They were also cast out of 90% magnesium and 10% aluminum which made them quite lightweight. It is still working fine. I did buy some new venom 98a super rebound bushings for them, which are far better than the worn out bushings. I also bought some replacement wheels, 83mm Abec 11 Flywheels. Hopefully I won't have to make the truck spacer higher to prevent wheelbite. I have a pair of ACS Lite II trucks on my fiberglass board. I bought them in 1979. They are 90% magnesium and 10% aluminum, which makes them lighter than standard trucks. The pivot cups are compatible with pivot cups from 2013. I think the factory ones are about 2mm longer than current ones, but the current ones fit fine. The bushings are cylindrical and are about 26mm in diameter and about 13mm high. 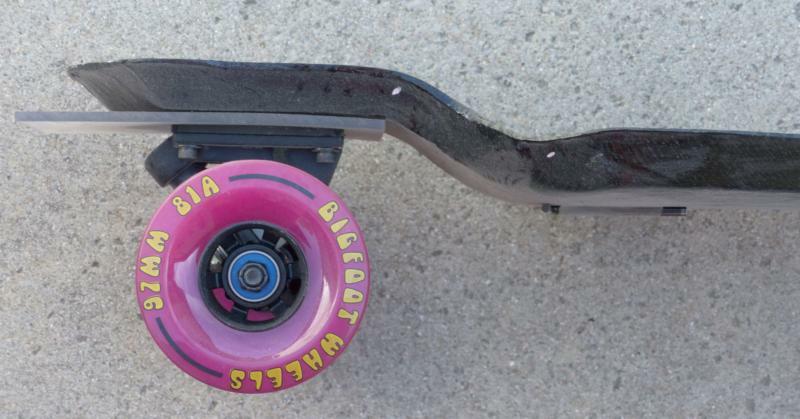 I replaced the bushings with Venom 98a super rebound bushings, which has greatly improved the ride quality. Some paint has come off of the trucks. I suppose I could repaint them if needed, but I suspect I will defer it for a long while. I liked my fiberglass skateboard, but I wanted it to be lighter. I went through about 6 iterations. I made a fiberglass skateboard that was thicker in the center than at the sides. It was 34.5 inches long and 10 inches wide. It was much too flexible, and I damaged the top (fiberglass is stronger in tension than compression). You can see the fiberglass failing on the top surface. It wasn't a bad idea, I just should have made it much thicker. Next, I tried using vertical grain balsa wood in the center. I bought a 3*6 inch piece of balsa wood, and cut it into 1/4 inch thick sections. I then glued the sections together edgewise. It is difficult to make the sections exactly the same thickness when cut with a bandsaw. I ended up doing a lot of sanding. This made a very pretty skateboard. The final board was pretty stuff, perhaps too stiff for my tastes. It was 36 inches long and 10 inches wide. Unfortunately, I didn't use enough fiberglass on the top of the board, and it broke, which is plainly visible in the first picture. I tried a few more times, but I should have made the balsa wood thinner and the fiberglass thicker. Finally, on my last attempt around 1985 or so, I build a board for a friend. I had learned that 1/4 inch was too thick, so he bought 1/8 inch thick marine grade plywood. It was 33.75 inches long and 10 inches wide. He bent the end up in a kicktail. We used lots and lots of fiberglass. It was lighter than an all fiberglass board and it was reasonably flexible and quite strong. For 10 inch wide boards, it is a good idea to use trucks about 180mm wide. I was unable to find any locally, so I bought a pair on ebay. They are available unpainted, and in black. There are breast cancer awareness trucks, that are painted pink, which looked really cool, but were more expensive. I ended up with black trucks. 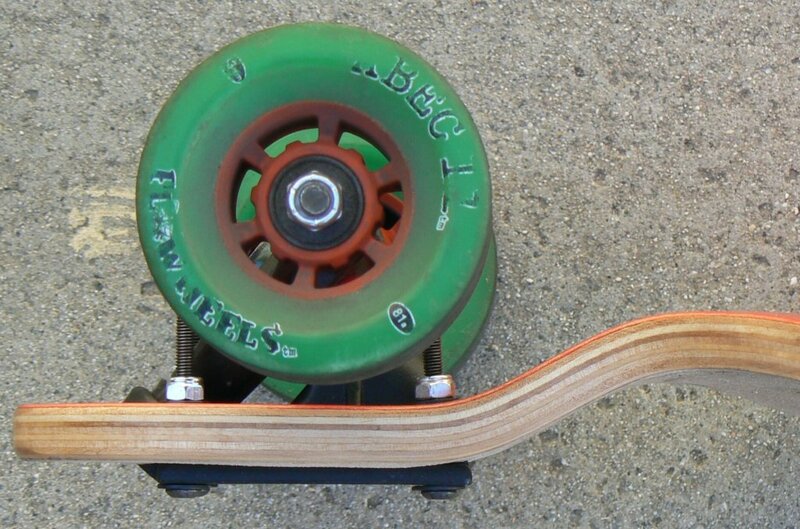 These are reverse kingpin trucks, which was designed for longboards. The trucks are well finished, and very light. I called Randal, and they sent me bushings appropriate for my weight. By default, the kingpin bolt nut is on the side of the truck closest to the board. This maximizes ground clearance, but makes it difficult to change bushings or the truck hanger, as you have to take the bolt out, and then reattach the nut. If you reverse the kingpin, it is much easier to work on the truck, though you will have to remove the truck from the board (unless it is top mounted). Highly recommended. I bought a used Omen carbon matrix. It is a carbon/foam board. It has all kinds of contours. The trucks are at the far ends of the board. They are 3/4 inches higher than the rest of the board. The board is dished 0.666 inches from side to side for more stable footing. The edges are thicker which makes them easy to grab. Some people use it for downhill riding as it is quite stiff and stable. The guy I bought it from said he went 45 mph on it. Unfortunately for me, it doesn't flex at all. I bought Randal RII 180mm trucks for it and 97mm wheels. I replaced the stock Randal bushings with a lower cylindrical 98a bushing, and the upper bushing with a Randal conical green 95a bushing. I really should get even firmer bushings, as they are pretty soft for me. 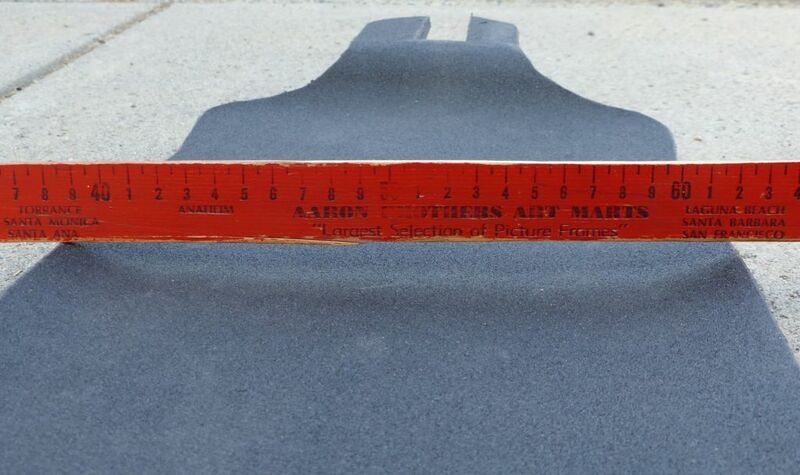 Of course in 1979 when I built my fiberglass board there were no trucks that wide (or trucks designed for longboards at all) and there were no 97mm wheels. I added a 1/8 inch rubber shock pad. 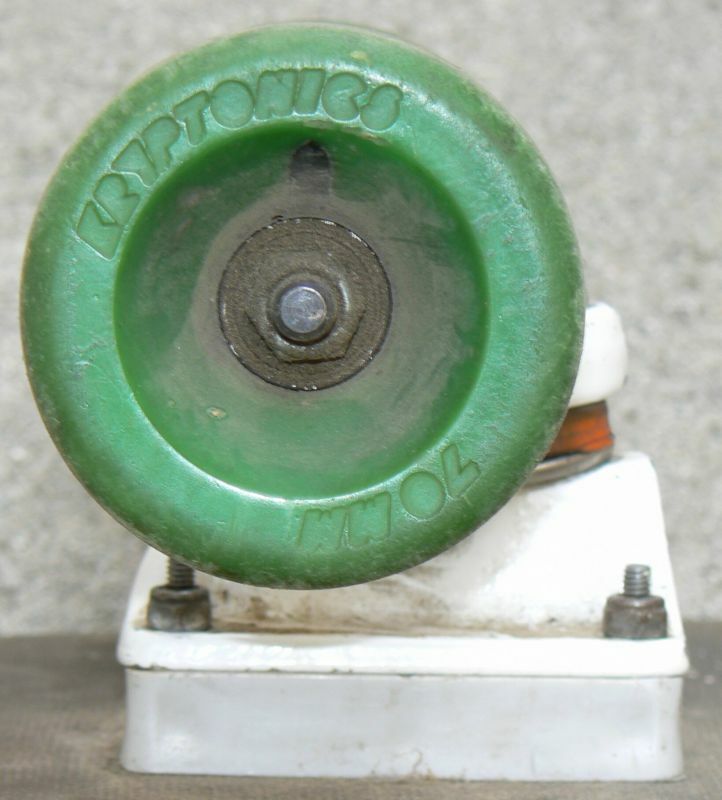 You can see with the side view that the wheels are pretty close to the board. Thanks to the shape of the board, there is plenty of clearance. If you look at the top of the board, on the ends you can see my home made polycarbonate nose protectors. I needed another skateboard, which was inexpensive. I decided to get a wooden board from Gorillaz Ride Shop, because they have inexpensive 2nds. I got a drop-down, drop-through no-name wood skateboard board for $15. It is made out of 9 plys of what is likely maple. It is 40 inches long, with a wheelbase of 33.5 inches. In addition to droping down about 1 inch it also has a small dish of about 1/4 inches from side to side. 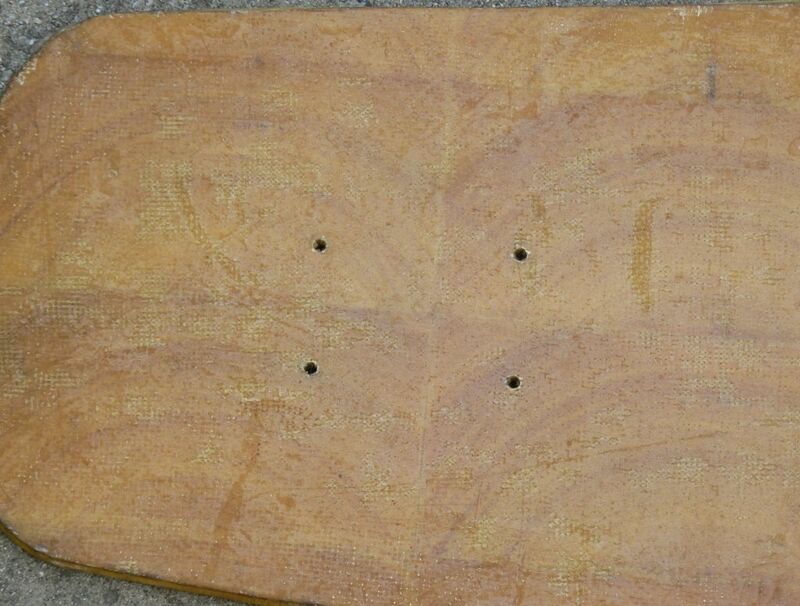 It is quite impressive how wood can be formed into a skateboard. It is just a tiny bit flexible. I was concerned with the drop-through mounting, as I feared that putting a big hole in a thin piece of wood would put too much stress where there wasn't a lot of material. So far, so good. I wouldn't suggest jumping on it, but it is holding up so far. 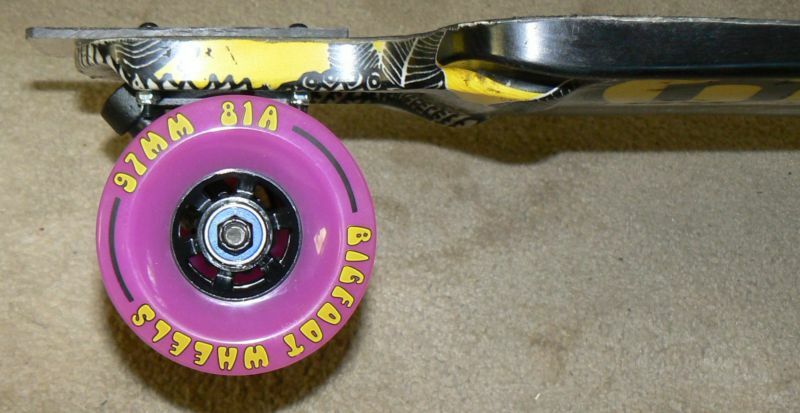 I put on some Randall trucks and some Abec 83mm flywheels, which I had purchased used from Stoked Skateboards. It sure rides low, which is great. I will add polycarbonate nose protectors for the ends of the board to keep the board from splitting when it runs into something hard. This is a carbon fiber and foam drop deck longboard. It is concave from side to side. The length is approximately 40" with a 33" wheelbase, 1.5" drop, and just under 3 lbs. There is minor wear at the ends (6th and 7th picture) and a small scrape in the bottom in the center (4th picture). 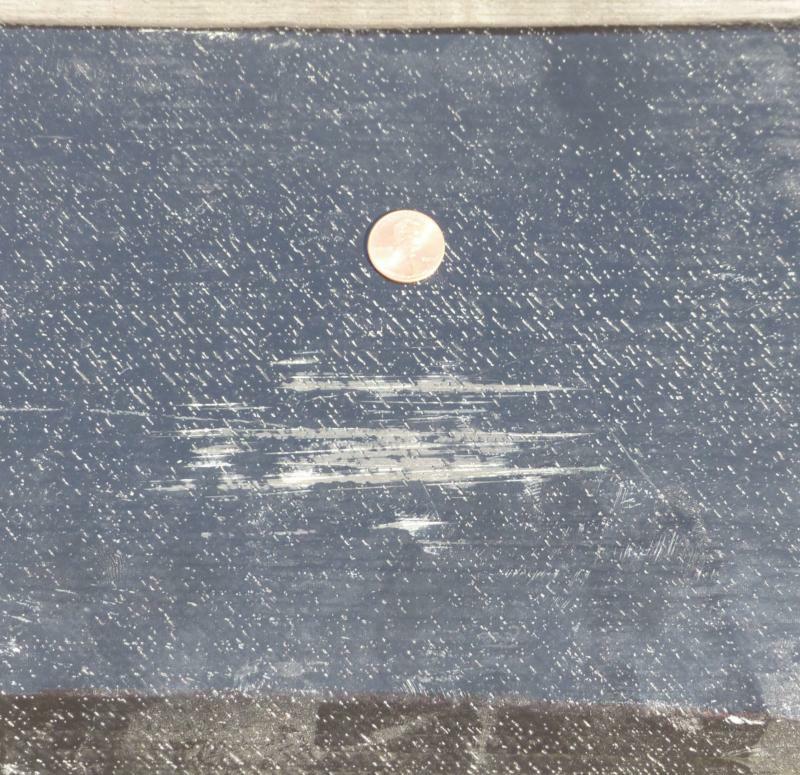 There is a penny next to the scrape, to give a sense of scale. On one edge, there is some minor damage (5th picture). The truck mounts are threaded inserts (no through holes), and a there is a glassy finish over carbon twill. This is a very light and strong board. I bought an ArcLight Xenon carbon board. Their website is down, and very little information is available on the board. 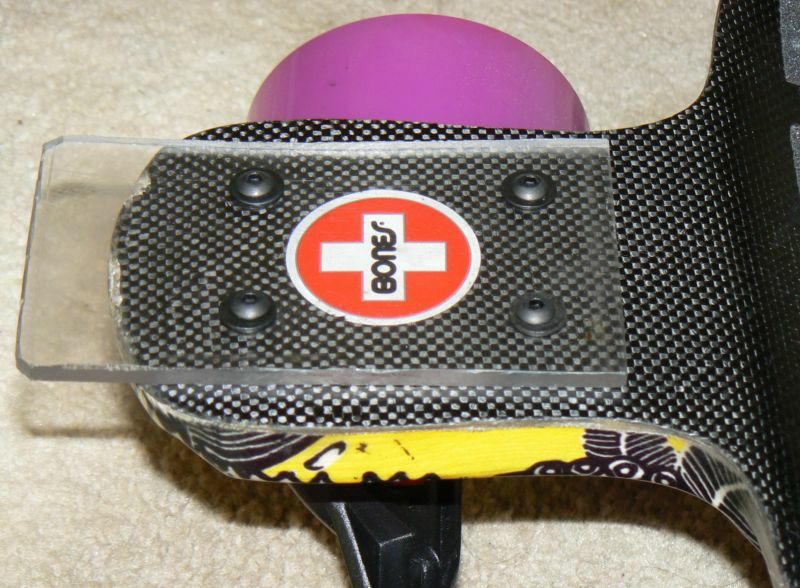 It is a carbon and foam board with a drop-down design and top or bottom mounted trucks. It is 40 inches long, and they also sell a 35 inch long version. The 40 inch long model cost $185 with grip tape. I think it is their most complex and most expensive board ArcLight offers. I had to buy new trucks as my Randal RII trucks have two reinforcing webs that stick out and is not compatible with the Xenon. I thought about cutting the web away, but there is likely a reason it is there. I ended up buying Caliber 50Caliber trucks. The board is much heavier than my ATC SR71, which is a good thing. The SR71 is a very light board and flexed a bit. The Xenon weighs 1900 grams with grip tape (but nothing else). It looks like it contains a lot of carbon fiber. 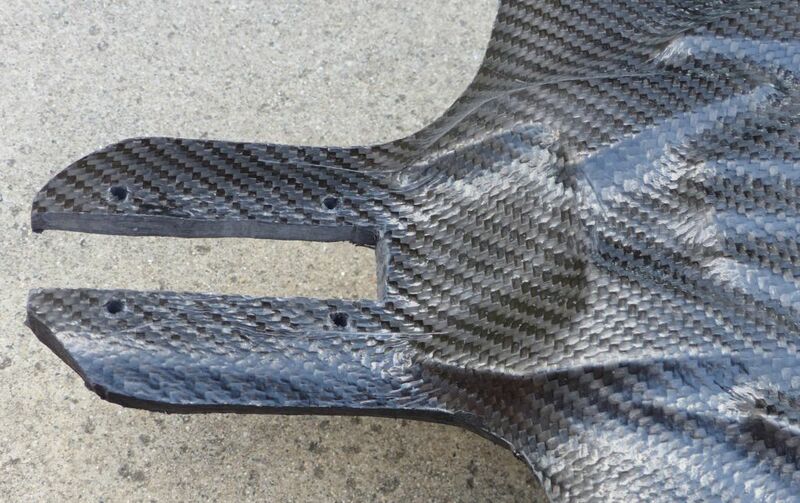 For example, the ends where the trucks attach seem to be pure carbon fiber, and are roughly 1/2 inch thick. They tested its impact strength by running it into a brick wall at 45 miles per hour. They said 'the board survived and was perfectly able to ride away'. 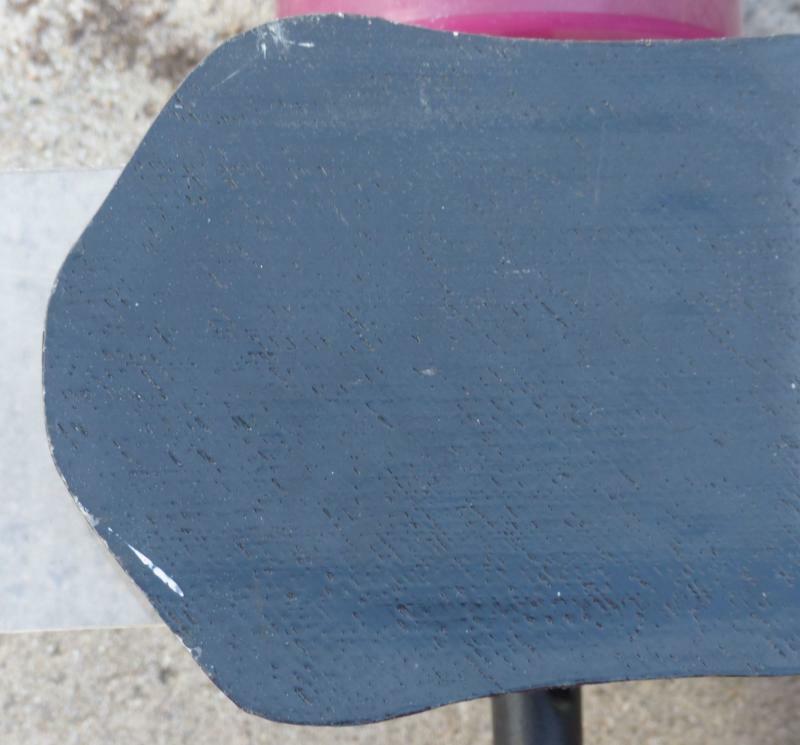 The board design was tested with a 350kg load cycled 5000 times without failure. Well, I now have the trucks bolted on. The first truck went on with no issues. The second truck didn't want to bolt on. It turns out that one hole is a bit off. I had the clever idea of using a #8 bolt rather than the normal sized #10 bolt. It didn't fit. I was able to use a #6 bolt on one hole, with the other 3 bolts being #10. I suspect the holds were drilled by hand. If I was a bit more adventuresome, I would drill the correct hole. It wouldn't be easy due to two factors. First, the existing hole overlaps quite a bit, and second, the hold goes through roughly 1/2 inch of solid carbon fiber, and I have no experience, nor drill bits for carbon fiber. This isn't a super big deal, given that is a very low production board, but it could be better. I don't really understand the reasoning behind the pattern on the bottom. It does look cool, but the 'love handles' on the Omen Carbon Matrix makes it very easy to carry the board, far easier than the Xenon. Overall, I am very happy. The board is significantly lower than my Omen Carbon Matrix, which was the most important factor for me. 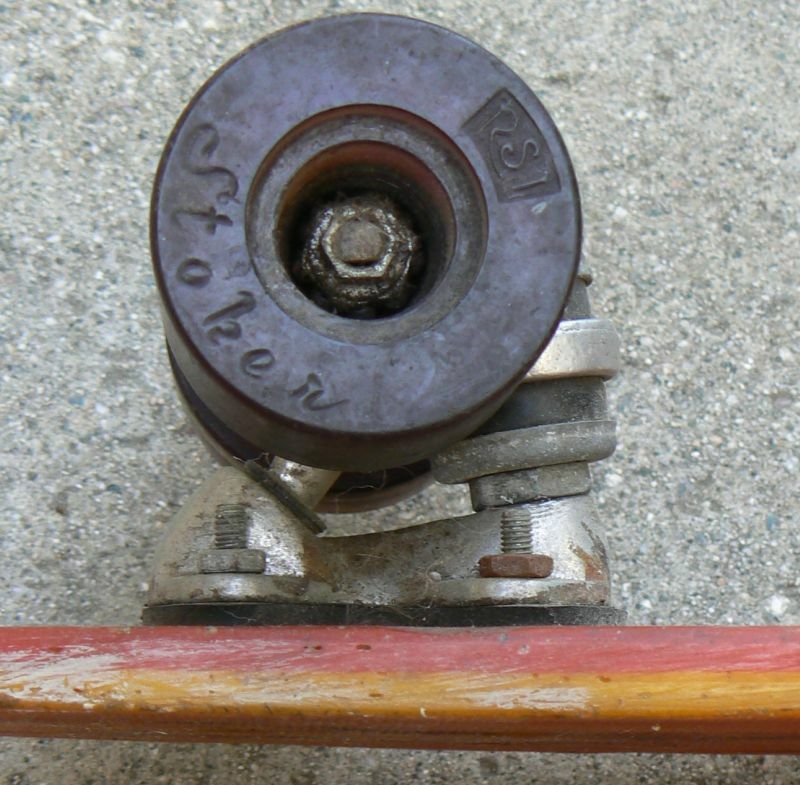 Using the stock Caliber bushings, I had wheel bite on the edge of the board. I switched to thicker venon cylindrical 98a bushings, and the wheel bite stopped. I am pretty sure it stopped because the axle got further from the base plate. In any event, the wheel bite is gone. I bought my Omen board used, and there was small dents at the ends. 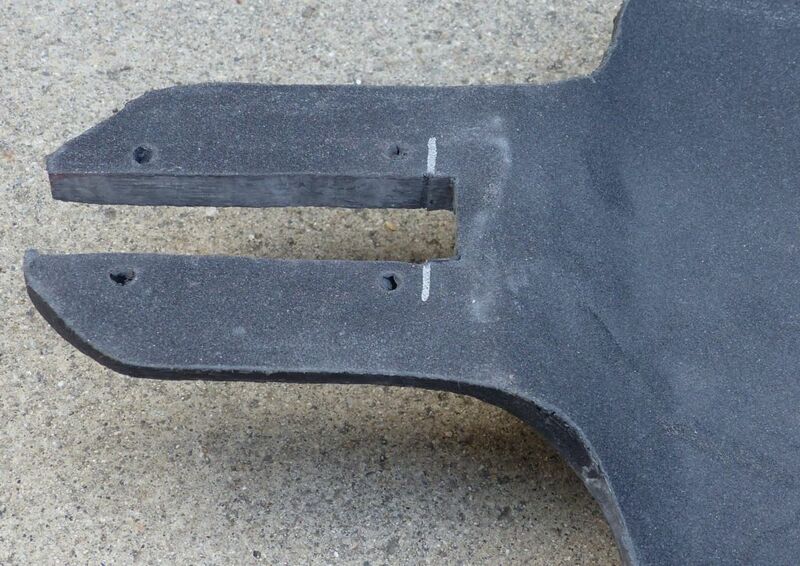 You can buy steel noseguards which are about $20 each. Being cheap, I decided to make my own. I took a 3/16 inch thick piece of polycarbonate and cut it in a square 3 by 5 inches. Using a truck spacer, I marked holes to drill, and drilled them. 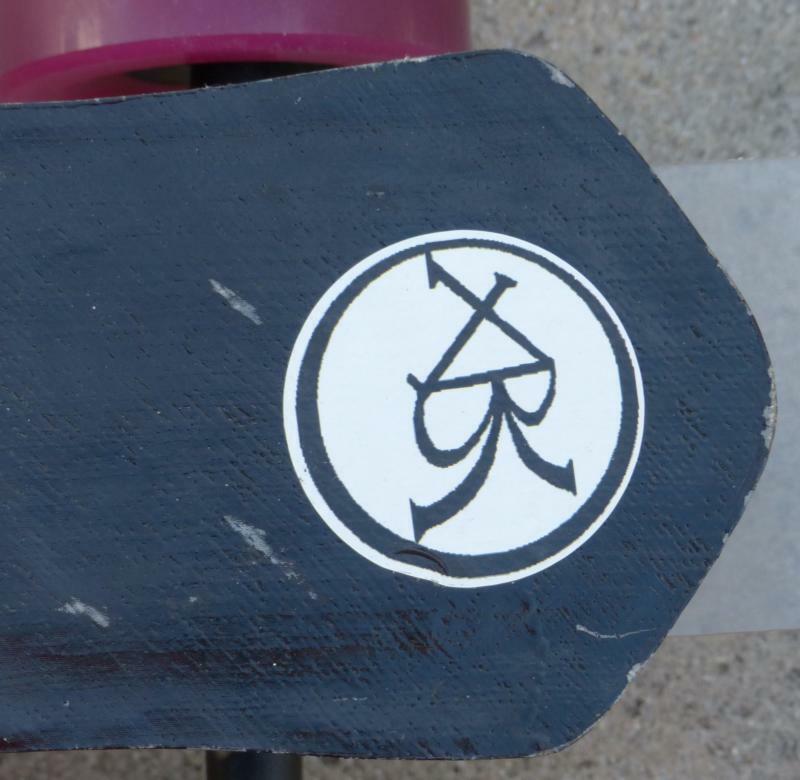 Installed, it sticks out about 1/2 of an inch beyond the end of the skateboard. Since the piece of polycarbonate I had was about 9 inches wide, I ended up making 3 of them. Since my Omen board is symmetrical, I used one at each end. Polycarbonate is cheap and very easy to work with. It is also very tough and impact resistant. It does scratch easily, but I don't care. It is used to make helicopter bubbles as well as 'bulletproof' glass. I used a hacksaw to cut it, though the cuts weren't as straight as they would be with better cutting tools. Close enough, and should work great. I am surprised that nobody is making commercial versions to compete with the expensive steel noseguards. It is clear to me that most skateboarders don't know much about mechanical engineering, and some companies take advantage of that. I was in the market for trucks and there is a lot of good information as well as misinformation about them on the Internet. Consider axles. It is pretty obvious that larger diameter axles will be stiffer than smaller diameter axles. Still, 10mm axles are quite uncommon compared to 8mm axles. With respect to specific materials, there is a lot of confusing statements. For example Buzzed Precision Trucks says "Axles made from Stress-Proof Steel (nearly 3 times as strong as competitor's)" I am not sure exactly what they mean by 'strong', but lets look at a few facts. All steels are equally stiff (modulus of elasticity), so they can't be talking about stiffness. Perhaps they are talking about tensile strength. Stress proof steel is reasonably strong (yield strength 100k psi) but the elongation is only 8%. Grade 8 steel has a minimum yield strength of 130k psi. Grade 2 steel has a minimum yield strength of 57k psi. So what is it that Buzzed stress proof axles are 3 times stronger than? 7075 aluminum has a yield strength of 73k psi. Their axles aren't even 3 times stronger than 6061 aluminum. Perhaps they did an axle strength test like Theeve did. If so, they should publish their results, like Theeve did. It is quite unclear what material they are comparing their axles to, and at best their '3 times' is marketing hyperbole. If they really are '3 times' stronger, they should say what they are comparing their axles to. So who has strong axles? Theeve Titanium Trucks have done a load test, and their TiH axles are about 2.5 times stronger than conventional axles. Of course, the TiH hanger/axle is one piece and made out of 6/4 titanium (they aren't inexpensive). I can believe their strength claims, unlike Buzzed. Theeve also have a lower priced CSX model that is about the same strength as conventional axles. What other strong axle designs are out there? Revolution Trucks use a 1/2 inch diameter 4140 chrome-moly axle, and turn down the ends to either 8mm or 10mm. The axle hanger is made out of Zytel 8018, which is fiberglass reinforced nylon. I don't know why all axles aren't made like this. Why are there so few magnesium trucks around? I know Tensor, Destructo and a few others make them. Magnesium is less dense than aluminum and easy to cast. It is a pretty decent material for skateboard trucks. My ACS trucks from 1979 were 90% magnesium. I have no idea why so few trucks are made out of it anymore. I bought some parts from Stoked Skateboards, who are really friendly. Their hardware is quite reasonably priced, and their 'Mystery set of Used Wheels' is a great value. They have great customer service. I also bought some parts from TGM Skateboards, who have really good package deals on trucks, wheels, bearings, and mounting hardware. They also have great customer service.